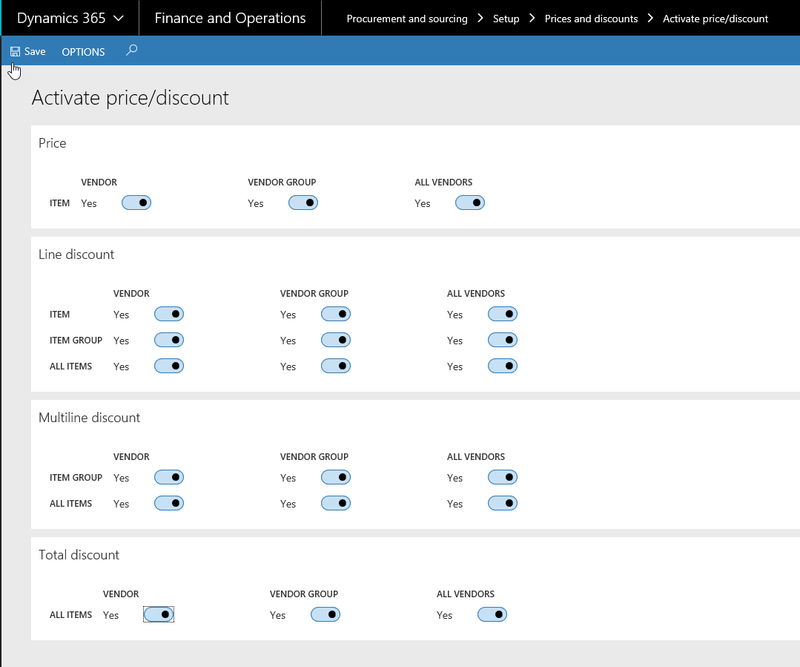 The trade agreement journals (briefly known as price/discount agreement journals in AX2012) are a very powerful tool in Dynamics 365 for Finance & Operations. The price engine is very sophisticated which means two things; a lot can be accomplished with them, and they are pretty complex to set up. A thorough understanding is required to achieve your expected goals. This blog post will not go into the actual price/discount journal functionality, it is simply supposed to point out a couple things to pay attention to prior to using it – things this author learned the hard way! Stay tuned for another blog post coming soon about tips and tricks for using the trade agreement journals themselves. There are quite a few important things to be aware of before you even start setting up price and discount type journals. These are pretty important to be aware of, as most people forget to set them up beforehand and then have a hellish time troubleshooting why the journals or the price engine itself does not act the way they expect it to. All inventory dimensions contain these two check boxes: For purchase prices and For sales prices. They indicate whether this particular dimension should be included as a factor in the price search for the item that has the dimension group assigned to it. Or in plain English, whether you should be able to set up a specific price based on this particular dimension. So for example, if you enable ‘For sales prices’ for batch number, that means you will have the ability to create and post a trade agreement journal for a particular batch. When the price search engine runs, it will first look for a specific price for this batch, and only if it does not find any, will it then look for a generic price without a specified batch number. You need to make these decisions on product, storage and tracking dimension groups. 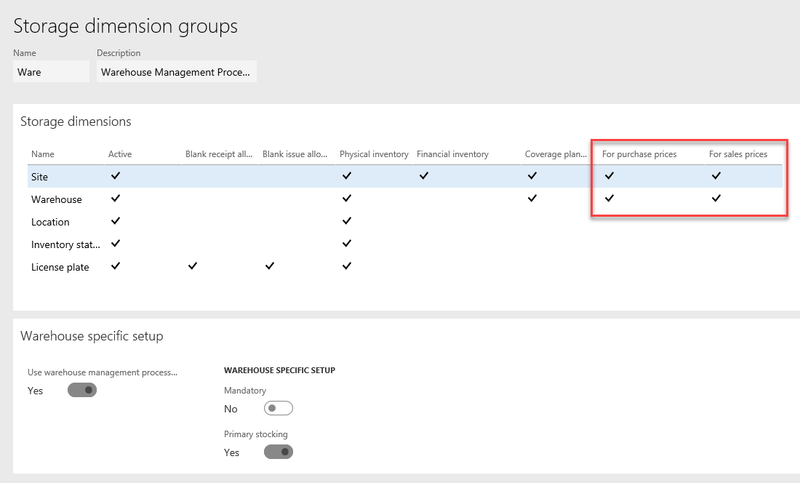 The good news here is that these are the only fields you are able to change at any time on a storage dimension group, even if you have assigned it to an item and transacted on the item already. These setup changes do not affect historic data. 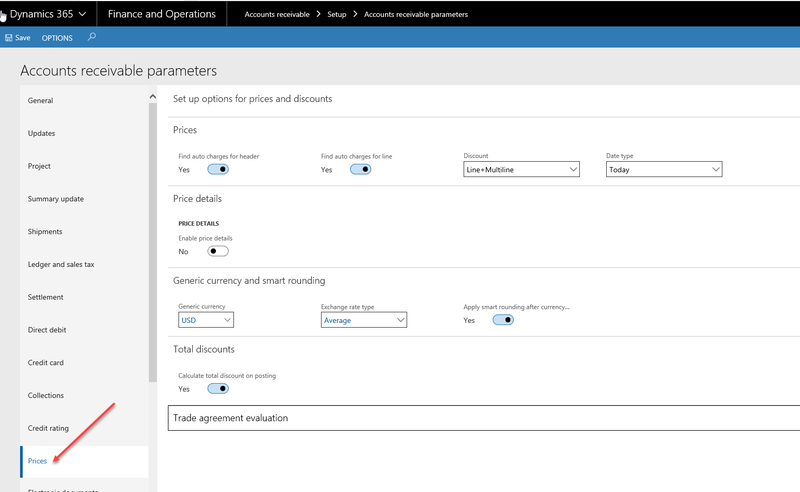 One thing that Dynamics 365 users/solution analysts quite often forget is that the decimal place setup on the unit of measure will have an impact on the trade agreement journal lines as well. If you need to set up prices/discounts for a partial unit of a product (half a roll, quarter case, etc), you will not be able to do it if the unit of measure is set up with a 0 decimal position. The decimal setup of course has a huge impact on a lot of other areas regarding the unit of measures, but this blog post is focused on the trade agreement journals. In both modules (Sales and marketing and Procurement and sourcing) there is a Setup / Prices and Discounts / Activate price discount menu item. It is very important to make sure that all account – item combinations you would like to use are enabled. If one of them is not, you are going to get a message when trying to create the journal line about illegal combination. Well, now you know what has been missed if that message keeps popping up! On the flip side, it is also important to turn off the ones you would like to prevent users from using. Another often forgotten thing is to set the trade agreement and charge related parameters. The Prices tab of both the AP and AR parameters has the settings for charges and discounts. This blog post will not go into detail about all of these fields, but as far as discount journal postings are concerned, it is really important to make sure to specify what happens when multiple discounts are found for the same order line. The company likely has policies about this situation and it is important that our settings reflect that. If you are using total discounts, make sure to toggle ‘Calculate total discount on posting’ to ‘yes’. If you don’t, the system will not apply the total discount, even if valid discount journals exist. 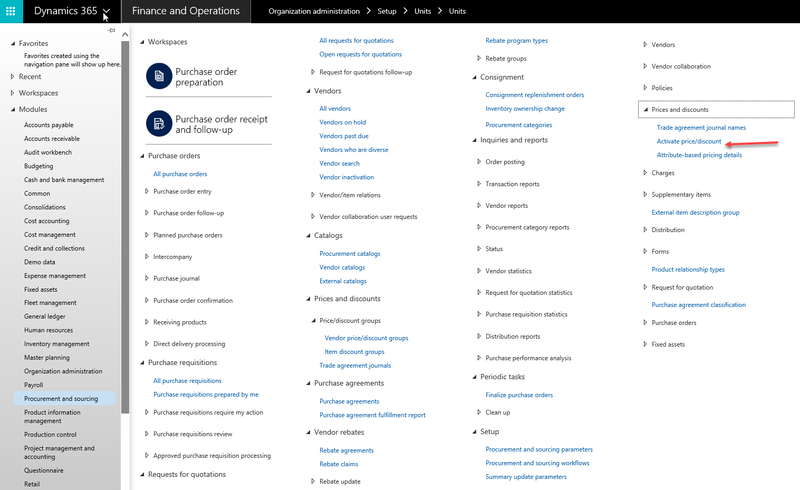 If you have any questions about using Dynamics 365 for Finance & Operations, please feel free to contact us. We specialize in providing technical assessments, break-fix support, optimization services, and solution expansion projects for Dynamics 365 for Finance and Operations. Katalin is a senior business solution analyst with Encore, specializing in Microsoft Dynamics 365 for Finance and Operations. Katalin's efficiency as an ERP consultant is based on her history in sales, inventory management and purchasing. She believes that having operations experience is a very important basis when your job is to advise others about their operations. Her main focus is logistics, SCM, warehouse management and transportation, discrete and process manufacturing.